Both billiards and pool are indoor sports. Billiards is a reference name given to a bunch of three games; pocket billiards, snooker carom billiards. All the three games involve the use of a cue stick and balls over a table covered in cloth with rubberised or leather cushions on the edges. Both billiards and pool can be further classified into cue games, which is one of the main similarity between the two. Billiards is a reference name given to three different cue sports. The very original name for this sports was ‘carom billiards’ or ‘carambole billiards’. This game is similar to pool but is played on a clothed table that has no pockets. The types of carom billiards include straight rail, balkline, three cushion billiards, cushion carom and artistic billiards. The name carom originally came from a Portuguese and Spanish term called, ‘carambola’ that means rebound after hitting. This term came into normal use in the 1860’s. The balls used in billiards are larger and heavier than those used in pool. The table cloth in the game also facilitates faster movement of the balls during the game. Billiards involves playing with three balls where one of them is red, one is yellow and the other white. The yellow or white ball can be used as strikers or cue balls. The process of hitting the target balls with the cue balls as you make three rails in tandem is called ‘carom’. Pool is an indoor game that was originally known as ‘pocket billiards’. This game goes back to the 18th century, where players enjoyed the game in pool rooms as horse gamblers pool money that they would bet with on the races. From, this the game was then linked to poolrooms and gamblers. Later on pool was recognised as a sport for rich and refined people. This group tried to change the name of the game constantly, but no efforts bore fruits as the name permanently stuck. The merchandise used in the pool game differs from that used in carom billiards. The balls used are smaller and the table is pocketed. There are also many types of pool games played across the world; eight ball, straight ball, nine ball, bottle pool e.t.c. The standard pool table, however consists of 6 pockets that are enclosed at the table edges. The cloth on the table is slow which reduces the pace of the balls. Two sets of balls are used in this game, one is coloured and the other is striped. The sets are combined to one single set of 7 which is later setup with a bunch of 8 black balls. The cloth used in billiards is fast making the balls move more swiftly on the table. The cloth used in pool restricts movement making the ball movements slower. The number of balls used in pool range from one to fifteen depending on the game type. In billiards there are at least three balls. 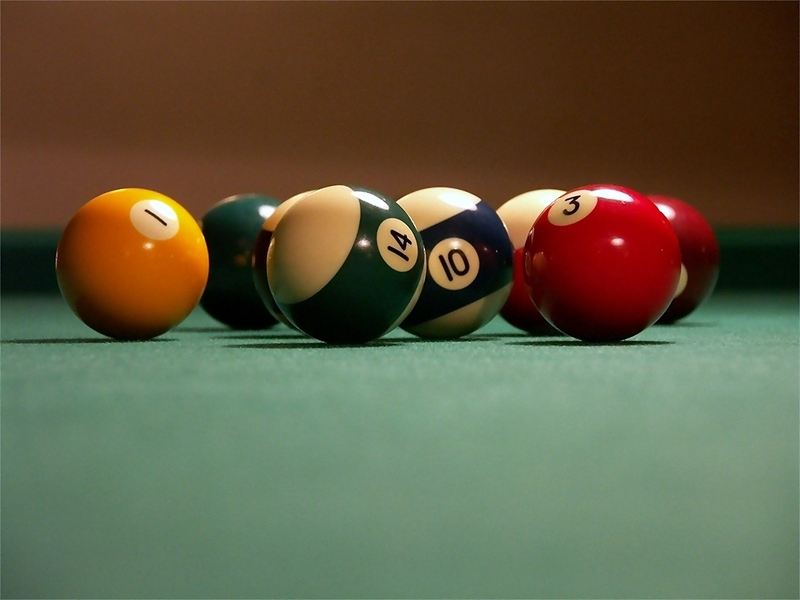 The balls used in pool are smaller than those used in Billiards. The sticks used in pool and long, slender and lean. The cue sticks used in billiards are thicker, shorter and have a fast taper. The table size of the pool game is three and a half feet by seven feet. The table size of the billiards game is five feet by ten feet. Billiards emerged in the 15th century. Pool dates back to the 18th century and was formerly known as pocket billiards. The objective of a billiards game is to score a fixed amount of points, or to score the highest number of points within a set time limit that is agreed upon at the beginning of the game. The goal of pool is to use the cue ball to hit the other balls and pocket them in specific groups or in a specific order. Billiards does not use racks while playing. Pool uses a rack that arranges the balls in a triangular shape when the game starts. This is used in the eight-ball, straight pool and several other pool games. However, in the nine-ball game a diamond shaped rack is used. The billiards ball is around 61.5 mm in diameter. The pool ball is 57mm in diameter. The British balls are however, 51 mm in diameter. In billiards the most popular game is three cushion billiards. In pool the most popular game is the eight-ball. Billiards and pool are indoor games played on tables with cues and balls. Billiards dates back to the 15th century while pool which was known as pocket billiards dates back to the 18th century. 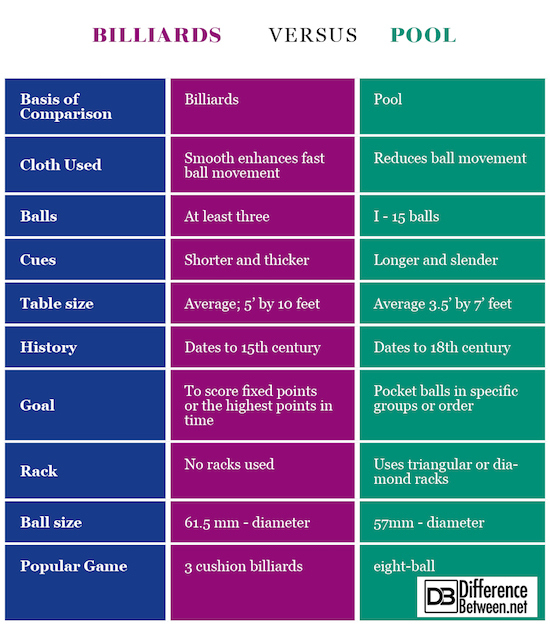 The table sizes, balls and cues used in both pool and billiards are different. The table and balls used in billiards are larger than those in pool. 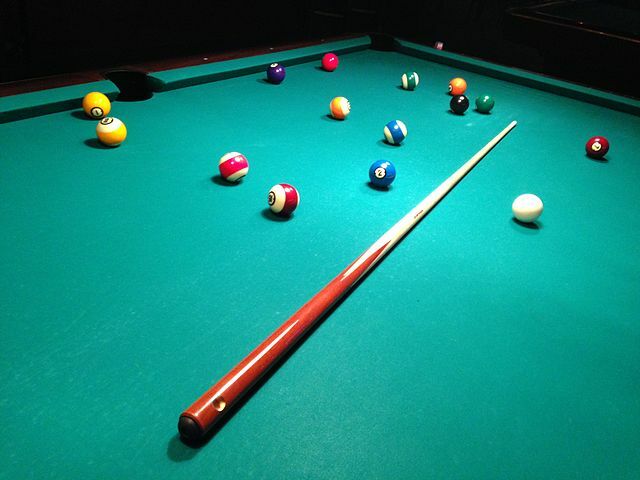 The cues used in billiards are also shorter and thicker in appearance. Evah Kungu. "Difference Between Billiards and Pool." DifferenceBetween.net. May 22, 2018 < http://www.differencebetween.net/miscellaneous/sports-miscellaneous/difference-between-billiards-and-pool/ >. A Handbook of Billiards: With the Theory of the Side-Stroke, the Rules of the Games, and a Chapter on Bagatelle. G.Routledge and sons, 1865. Kentfield, Edwin. The Game of Billiards: Scientifically Explained, and Practically Set Forth, in a Series of Novel and Extraordinary, but Equally Practical Strokes. To Which Is Added the Rules and Regulations Which Govern the Numerous Games as They Are Played at the Present Day in All the Counties of Europe. Smith, Elder, & Co., 1850. Cranfield, Arthur “Babe,” and Laurence S. Moy. Basic Pool: The Ultimate Beginner’s Guide. Skyhorse Publishing Inc., 2011.